Today we went swimming at the local leisure pool, which has an outdoor bit, the wind was nippy, the palms are being taken over by ivy but apart from that, in the blue water in the sunshine it could have been…the Med. I dutifully did my aqua exercises so fully expect to feel terrible tomorrow. 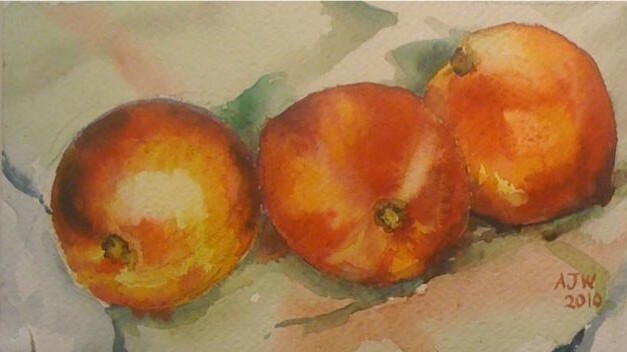 Here are the peaches which smell heavenly. 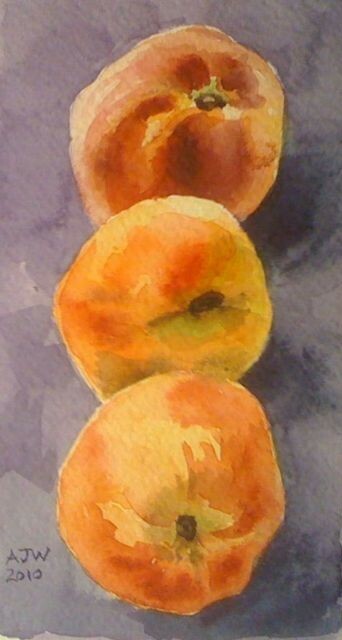 In France you pay extra for white fleshed peaches as they are tastier or rather more aromatic. Here, if you find them, on a market or in LIDL! they cost the same as yellow peaches. We made ice creams with the strawberries today, one with goats cream as a special treat for me and one with ordinary cream. Heaven was in a glass dish. Today we picked three pounds of strawberries and there are more to come. This was another day of shed mania, the shed needed putting back up and because it was taken down in lumps rather than all its components it needed carrying across flower beds and under the apple tree in ungainly, liable to break, bits. It needed all four of us and not all of us enjoyed the experience so attentions wandered and bits started wobbling off in the wrong direction. It has been so busy I did not even attempt a Sunday joint. 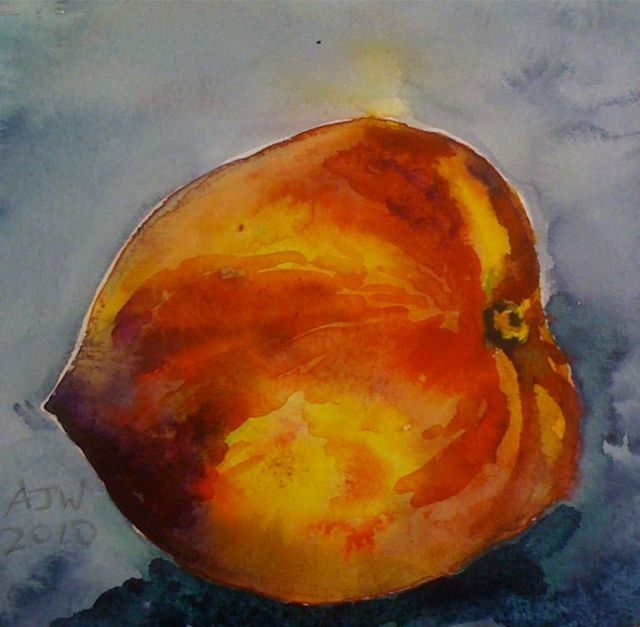 Anyway the painting is a very wet picture of one of the little peaches, by tomorrow they will all be gone, the smell is just too tempting. In fact its still wet and may well have altered as it dries by tomorrow! !I actually did two painting but the one of the chive flowers went pear shaped so here instead is a photo. I went to the allotment briefly today and discovered that there was good news and bad news: the first strawberry had ripened but a slug had eaten right through it in the night. I really hate slugs with a slow evil abiding passion.